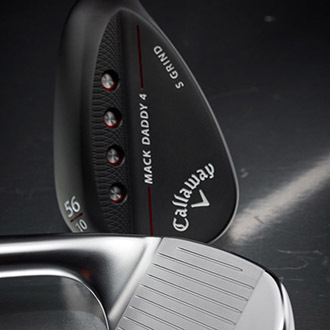 CARLSBAD, CA (January 9, 2018) - Today Callaway Golf officially announced the new Mack Daddy 4 Wedges, created by Callaway Chief Designer and legendary wedge maker Roger Cleveland. They will available at retail nationwide on January 26. The combination of a new groove and surface-roughening design, along with four available sole grinds, should give players more short game options and increased versatility around the greens. The immediate Tour conversion for Mack Daddy 4 Wedges has been impressive. Sergio Garcia, Branden Grace, Xander Schauffele, Henrik Stenson, Wesley Bryan, Daniel Berger, Si Woo Kim, and Adam Hadwin are among the players who are already using these wedges on Tour. Garcia and Grace have also won with these wedges already on the European Tour. Designed by Cleveland with extensive feedback from PGA Tour players, the Mack Daddy 4 wedges feature a new groove and surface treatment designed to increase spin. Callaway refers to the finished face design as Groove-in-Groove technology and says it helps generate more spin. The main grooves in the pitching wedges and gap wedges (lofts 52 degrees and below), which golfers typically use on fuller shots from the fairway, are deeper and narrower to perform more like irons. The grooves in the sand wedges and lob wedges (54 degrees and above) are wider and shallower to move water and debris off the hitting surface more effectively on shots hit around the green. All Mack Daddy 4 wedges were given a 16th groove, just above the leading edge, that Callaway calls a Nip-It groove. It is there to provide extra grab on chip shots from tight lies that are often hit thin. Cast from soft 8620 carbon steel for soft feel, the wedges are available with a choice of four sole grinds. The wedges are available in two finishes, platinum chrome and matte black. C Grind (8 degrees of bounce): This carryover grind now has more heel relief to make it easier to hit from tight lies with an open face. It is ideal for players who sweep the ball or play on firm turf. S Grind (10 degrees of bounce): This is a medium-width offering with some heel relief for versatility. W Grind (12 degrees of bounce): With a wide middle and toe and a narrow heel, this club has a generous amount of camber to help it avoid digging. It should work especially well in bunkers, thick rough and on softer turf. X Grind (12 degrees of bounce): This new grind features a narrow, high-bounce, crescent-shaped center section. With significant heel and toe relief, it is ideal for handling soft turf and fluffy sand.